I think I've told you already that my favorite books combine both mystery and romance, so it's only natural that the fourth book which I'd like to present to you today is a perfect mix of both. 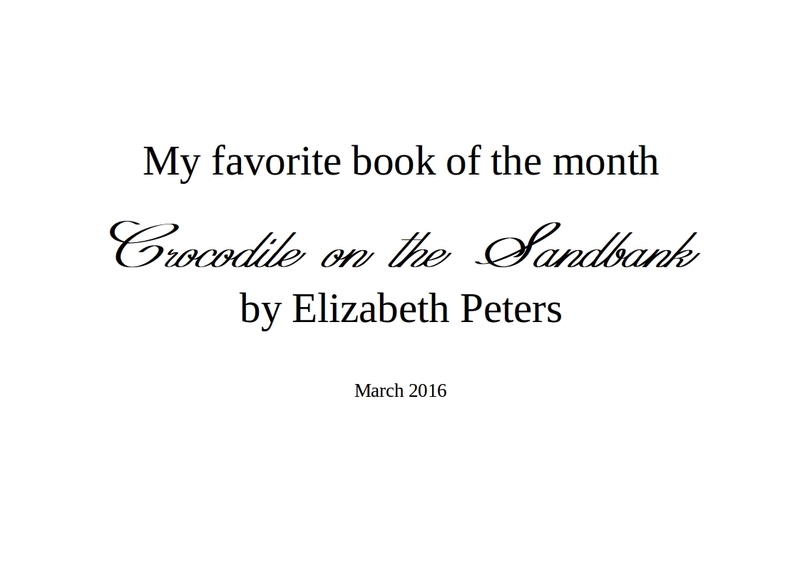 I'm talking about Crocodile on the Sandbank by Elizabeth Peters. There's one other element I can't resist, and that's humor. If a book makes me chuckle, I'm a fan. With Amelia Peabody, Elizabeth Peters has created a heroine that is irresistibly funny. Neither beautiful nor timid, Amelia does exactly as she pleases. Here's one statement that's absolutely hilarious, because she characterizes herself: "I have been accused of being somewhat abrupt in my actions and decisions, but I never act without thought; it is simply that I think more quickly and more intelligently than most people. I am an excellent judge of character." The entertaining part about this is that she acts most of the time without thinking twice, and that she's quite often taken in by the people around her who turn out to be the villains she's trying to overcome. In Crocodile on the Sandbank, Amelia meets the love of her life, but little does she know it. In fact, her first words to him are as follows: "And you, sir, are the lordly British male at his loudest and most bad-mannered. If the English gentle woman is covering the earth, it is in the hope of counteracting some of the mischief her lord and master has perpetrated. Swaggering, loud, certain of his own superiority . . . "
As the book is set around 1890, this is quite a statement, and it'll take illnesses and several other assorted catastrophes until this explosive couple finds happiness. 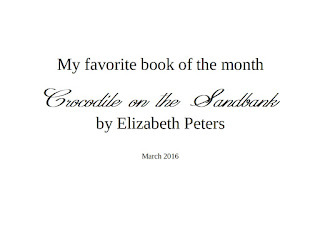 Crocodile on the Sandbank is a pure delight to read, a romp in Egypt that made me immediately buy the other books in the series, but the first one remains my favorite! Do you have any favorite books set abroad? What an incredible coincidence, Beate--I just finished reading CROCODILE ON THE SANDBANK last night. What a fun romp it was! I think I started one a few years ago and got distracted. I'll have to find it again. Just my kind of heroine. Lyn, you definitely have to find it! It's hilarious - I can only recommend it! Magdalena - this IS a fun coincidence. I love it that some books are popular all over the world, no matter where you come from . . . .
Another book to add to my growing pile of books to read. If only I could clone myself, I would have a writing self and a reading self. My favorite book is Amazonia by James Rollins. It is a suspenseful adventure with a little mystery and romance. LOVED the book. It kept me flipping the pages. Humor is a must in the stories I read, also. I'm not familiar with the book you mention but will check it out. Josie, let me know what you think once you've read it! And Margaret, I have to check out Amazonia. Is it a contemporary story? Merrilee, that cloning thing sounds like a good concept - can't count the books I want to read! Do you need a spring break? Distractions and spring and....where is my brain?